I was in kind of weird mood yesterday. I was exhausted from staying up watching the weather Wednesday night to make sure the tornadoes weren't coming right at us, then we got horrible thunderstorms and the power went out for a few hours in the middle of the night. It's weird how the power flickering wakes me up. Anyway, as I get older, these things really worry me. It was the first time I've ever been that close to such a destructive storm , we have no basement and more than anything, I worry about my boys. I know that seems kind of obvious, but the thought of that storm even coming close to us made me want to throw up. At any rate, we didn't get hit, but we have friends in Alabama (that are thankfully ok) and I'm just so sad for all the hurt any of them are having to go through. My in-laws (who are in TN) are without power for days. Thankfully they are all ok though. Thursday ended up being beautiful. Eventually, the sun was shining and I really just let it go. I thought it was so strange that through all the horrible weather that came through, it was breathtakingly beautiful. My thoughts are with all that have lost love ones. I decided to make a family favorite here for dinner so we could all sit together and share. I made our family style fried rice. To keep with the seasonal challenge, I had cabbage wraps, but I'm anxiously awaiting the lettuce season! Actually, I really liked this! Since cabbage leaves are hardier than lettuce, it held together like a wrap without falling apart. It's really easy to steam an entire head of cabbage. I just put the whole thing in the pot with the steamer rack and steam it until the leaves are tender, but still firm. I almost for the rooster sauce...that would have been a shame! I also tried something else that I found not too long ago at the natural food store (thanks to Lindsay for giving me the heads up on this! )...coconut aminos! This is definitely a great alternative to soy sauce if you can't have soy! Just a warning, it's not exactly the same, but it has a nice flavor that is very similar to soy sauce. It was a fun family dinner! Do you remember a family dinner you used to have as a kid? We always ate together so no meal actually stands out. It was a family rule even if it was 11:00pm we ate together. I remember watching Saturday Night Live while eating dinner on Saturday nights. Funny thing is, now, my sisters and I hate eating that late. Truth be told, we don't always eat together as a group, but I'm ok with that. I think it makes the times that we do a little more special. I'm so glad to hear you're all safe. I can only imagine how nerve-wracking it was being so close. Last summer we had a tornado warning (yes, up in VT!) and I was so freaked out. We don't have a basement, either - and even just yesterday I was a little nervous with there being tornado watches over in Albany! Can't even imagine being near the "real thing." I like fried rice in a wrap. Never thought of that before. And I think you're awesome if you ate most of the cabbage. Heh. 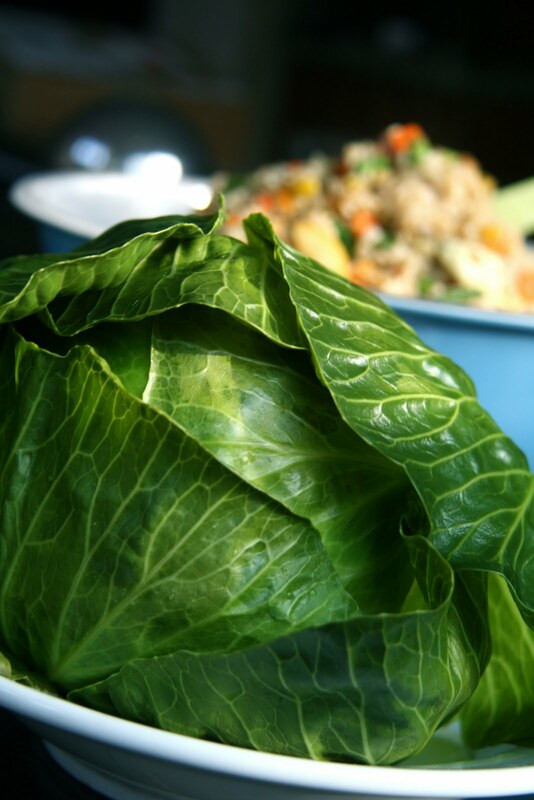 If we have cabbage, I'll just munch on it raw, which Mike finds rather odd. I'm so glad you guys are ok! The weather that has been going on all over the states has been nothing short of terrifying! I'm glad you are all ok -- I read about those storms and that is super scary! The meal I remember having as a kid was pork chops, white rice and canned corn :) I think my dad made that at least 3x per week! Dinner looks great! 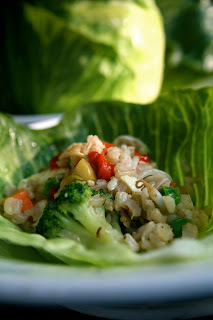 I like lettuce wraps a lot. Looks delicious! I'm glad you found a soy substitute. 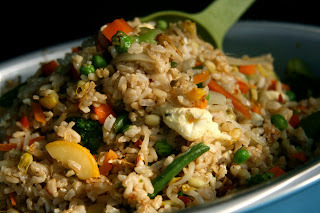 I love family dinner (and fried rice and rooster sauce!) and when I have my own family, I want to make it a tradition too. My favorite family dinners (as a kid and as an adult) always involve steak. And cake! so glad you are all safe, and that you've shared the secret of coconut aminos in place of soy. Thanks! I've never heard of coconut aminos - will have to check that out. So glad to hear everyone is safe! And my parents used to make us eat dinner at the dinner table every night. No ifs ands or buts about it! I'm so glad that you are safe!!! I've never been in that situation, but I bet is is SO nerve-wrecking it must be! I hate storms as well, Sarena and I was so nervous for all of you guys. I am so glad that you and your loved ones are OK. Let's hope we can get on with more beautiful, summer-like weather! Your meal looks awesome. We ate a lot of meals together growing up and I have so many fond memories surrounding them. I know that your boys will too. My son is gluten-free so I can't wait to try an alternative to the gluten-free soy sauce! Thanks for the heads up!!! gorgeous gorgeous! I love that dinner. And I so glad you like the coconut aminos. I think its worth the $$. Ya know? Mmmm...looks amazing! I always had family dinners as a kid, so nothing stands out too much, but birthdays were always fun. I always chose Make Your Own Pizzas, and my sister always chose Tacos! 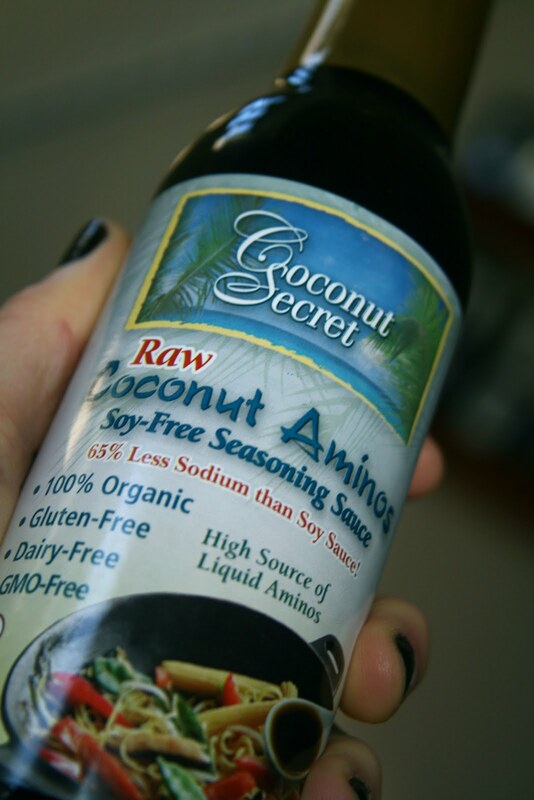 I have been wanting to try the coconut aminos too - all of this looks amazing! 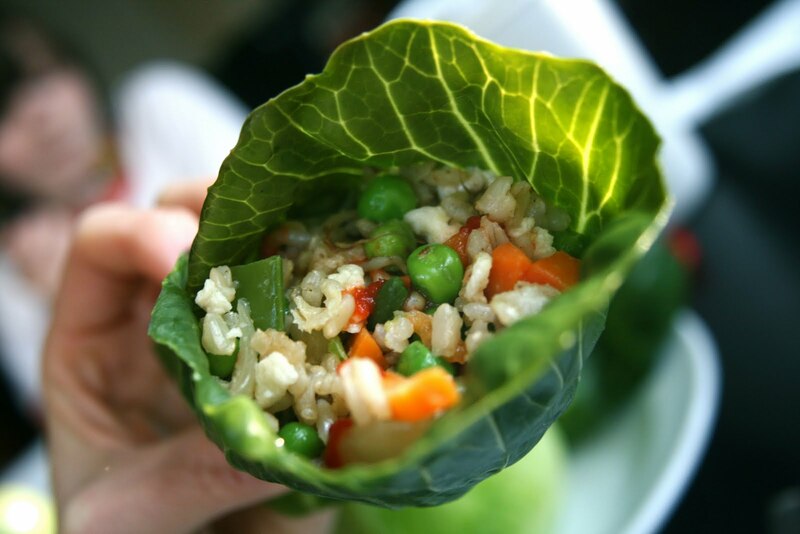 I love using lettuces as wraps. This looks great. We had a family dinners a lot growing up, we still have them on the weekends we grill out a big dinner. I'm so glad your family is okay. It really is so heartbreaking the devastation that is there. :( I hope your in laws get power back asap. We always ate together also, my mom would always make great meals. I hope you're feeling better, and I'm glad to hear that everything is okay. Eating your family dinner together must have been very special because of the scary situation. 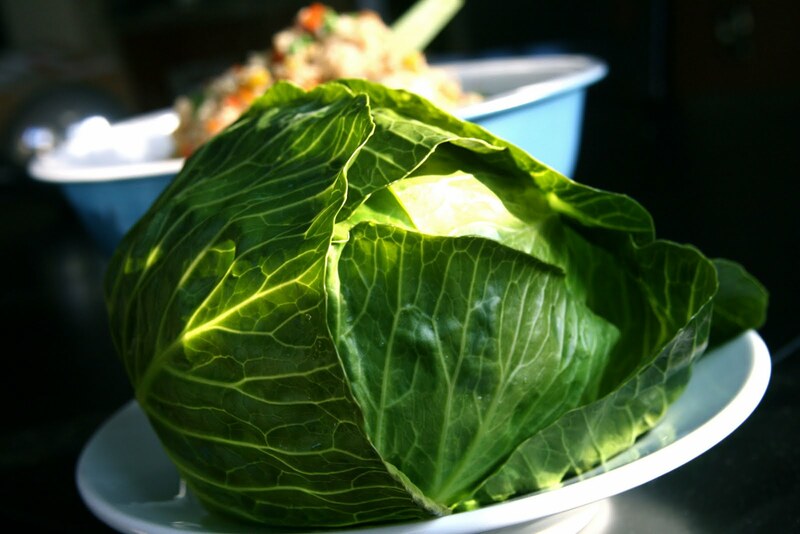 I love the idea of cabbage wraps! Could you post what seasonings you used? I would really like to recreate these! I usually use lettuce, but I like that cabbage would be a bit heartier. Sounds great! *Whoops, sorry! I just saw that you posted the link. I can't wait to make this! 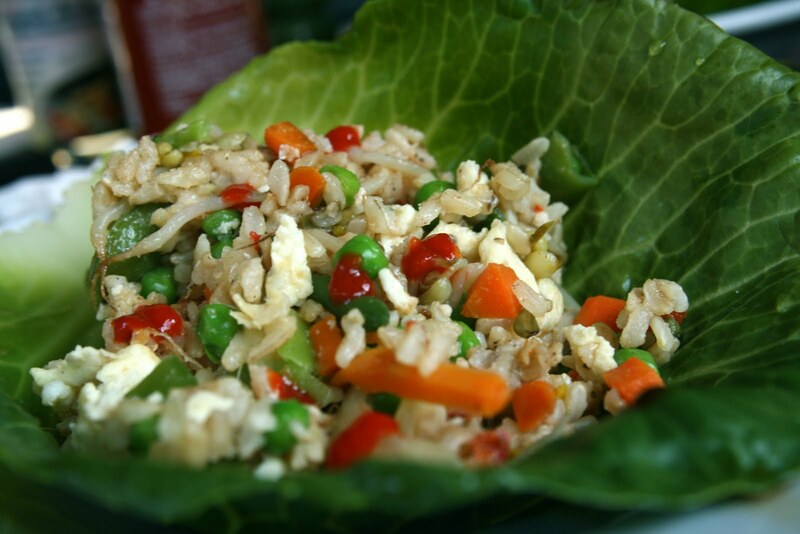 Those cabbage wraps look delicious. I love food you can eat with your hands! The best memories I have as a kid are of my family and I always eating dinner together, every night :-) It's a wonderful tradition. oh these are just beautiful and look delicious! I just heard about what happened in AL yesterday on the news (I am so bad about keeping up with current events). So glad that you and your family are safe. You had good reason to worry with what I saw in the news segment...unbelievable! My heart goes out to those who have lost. We almost always ate together as a family, and I think it's why we are such quick eaters because we always had things to rush off to!